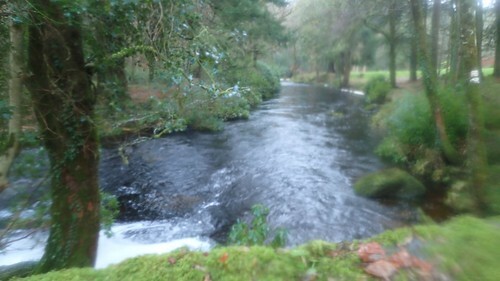 Our long-weekend away in wet and windy Devon was drawing to an end. My car was packed and ready for the inevitable drive home, while others might’ve been finishing up at the youth hostel, settling for a shorter walk or perhaps an early return journey to Bristol. 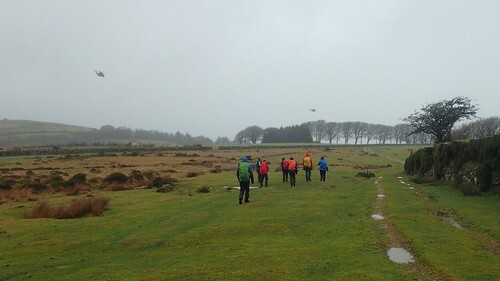 Only a few of us headed south once more and for the longest walk of the day, which began in the village of Chagford. I chose to rely on my SatNav for this thirty-minute journey from the north. 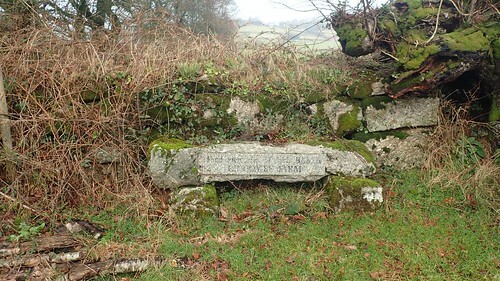 Many narrow lanes, climbing up and downhill, followed the crossing of the A30. A couple of roads had large fords crossing them, thanks to the recent flooding. With care, I made it through but I can’t imagine what it must be like for people living here on a daily basis and having to commute elsewhere. Four a village that has four pubs along it’s high street, I’d like to think that could be rectified in the near future. If you were to arrive very early in the day, it’s possible you could nab a free parking space on weekend somewhere. 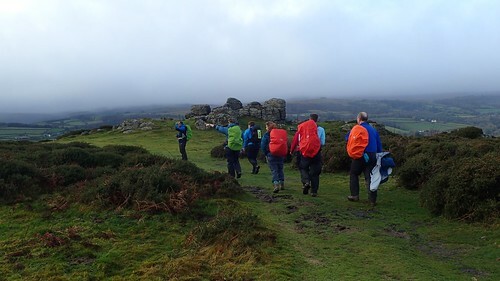 If you locate Dartmoor on an OS map, think ‘Dartmoor’ and attempt to plot a route, it is inevitable that you will soon find yourself climbing Meldon Hill, just as we did. 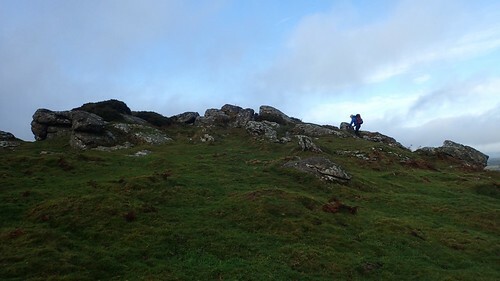 We were warned by local dog walkers than many of us were overdressed in our waterproof layers, while only Dave was dressed appropriately in his T-shirt, with the climb that was waiting for us. 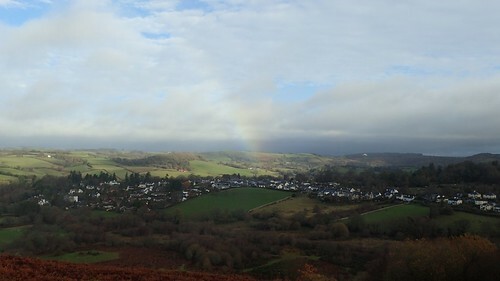 Chagford sits at less than 200 metres above sea level, while the top of Meldon Hill (which is a few miles south of Meldon) rises to only 390 metres high… It was such a long an intense effort, I really felt that we were gaining at least another hundred metres in elevation. While the rest of us were chasing the trig point! 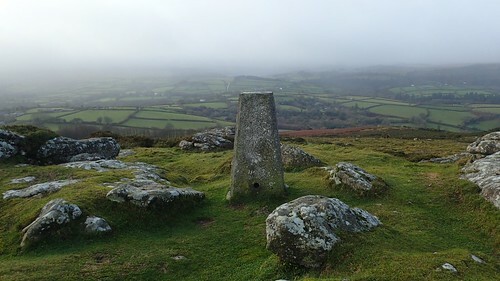 Meldon Hill – 390m above mean sea level. I think we stopped up here briefly for a deserved short break. 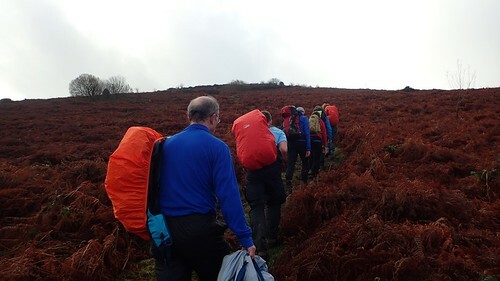 As tough as this initial ascent had been, we were still some distance from the heart of the national park and our day’s walking was anything but close to being done. These were some of the best views we’d received all weekend, amidst all of the rain and… Mist. Our descent of the other side of the hill was pleasant, compared to the earlier climb. 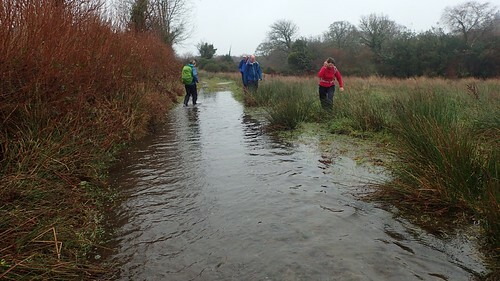 We walked the watery roads towards Jurston, where we would join the Two Moors Way. 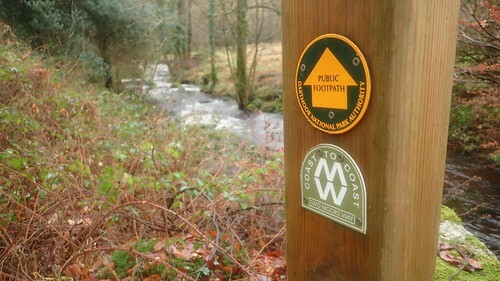 Although it’s not a National Trail, the Two Moors Way is a long-distance footpath (“Devon’s Coast to Coast”) that I’d like to attempt myself one day. I may even pencil it in for September 2019, depending on how my other plans work out. 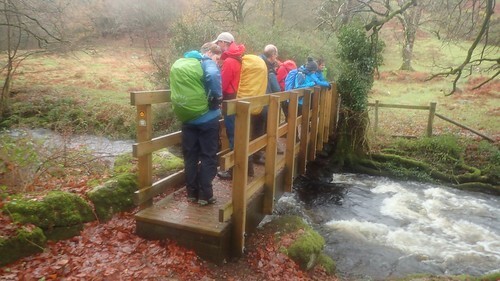 It was on this walk that we encountered perhaps the safest water crossing that any group member had witnessed throughout the weekend. No leap of faith required! We paused again for another snack break, or was it an early a lunch; having walked for a good while without respite since leaving the hill. 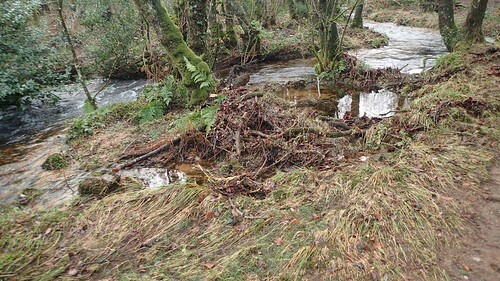 Meanwhile observing the after-effects of a waterway that had risen in recent days. 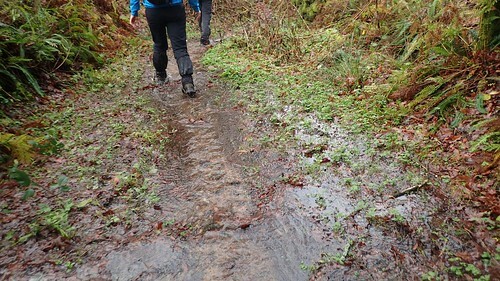 This was a bridleway, honest! 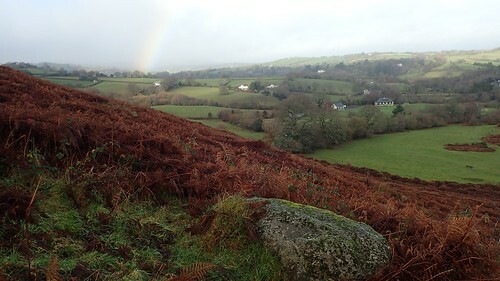 Somewhere near Teignworthy, we would leave the Two Moors Way and head up on to Chagford Common and Dartmoor National Park. 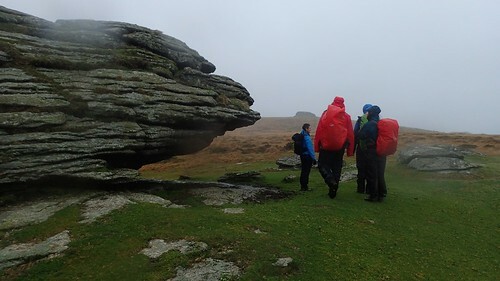 By the time we hit the moor, we met with the strong wind and it was time to wrap our hoods off in an attempt to fend off the persistent rain. Turning a corner in one moment, we paused to notice a pair of military or army helicopters passing behind us. 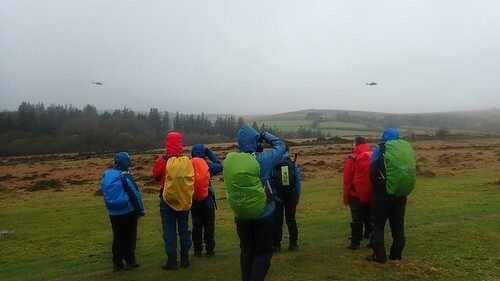 For a small number of us, this was the second time we’d witnessed this action over the weekend, having seen similar craft fly past us beside Meldon Reservoir on Friday. For reference, I think Fernworthy Forest was away to our left. They flew around us twice before heading off and presumably, back to base. Not a sight you’d expect to see very often in many other parts of the UK. We rejoined the Two Moors Way once more. Where, exactly, I can’t be certain. I remember that we were destined to reach Kestor at some point but at least the waymarking was spot on here, where we hadn’t such much specific to the trail earlier on. 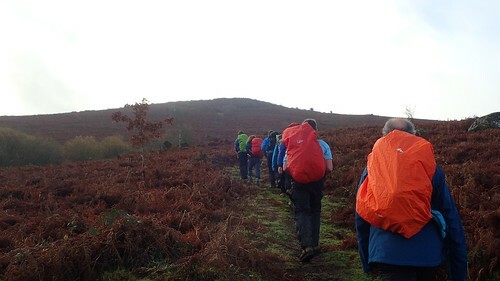 Current thinking: walk the Two Moors Way in September 2019. 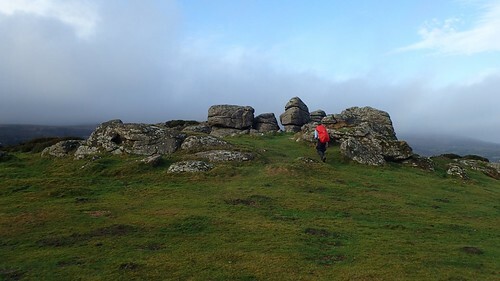 Thinking about it currently, my biggest fear about walking the TMW is tackling Dartmoor. 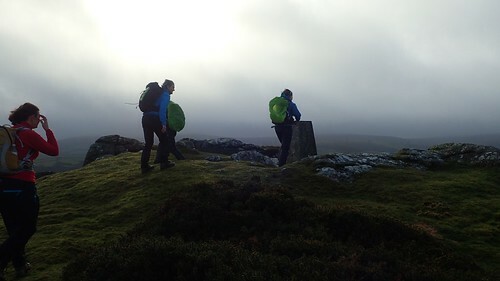 Partly from a navigational point of view; partly because it is said that a wild camp there is inevitable for one night, unless you’re someone who’s prepared to walk a high number of miles across difficult terrain in one long day. Logistically, I should be able to reach Plymouth via public transport. At the other end, I imagine I’ll need to call upon a friend to get back to North Somerset from Lynmouth. 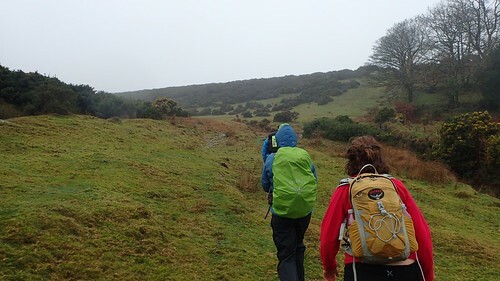 Before all of that though, I’d like to continue to reduce the weight and size of my pack and find the right walking boots for me, as this trail looks to be far removed from civilisation at many points, unlike your typical coastal path. 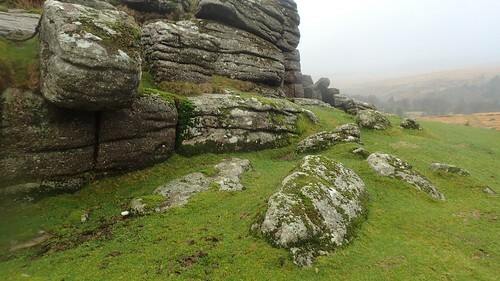 I’ve even read that the existing waymarking to guide you across Dartmoor is inaccurate and not to be relied upon. 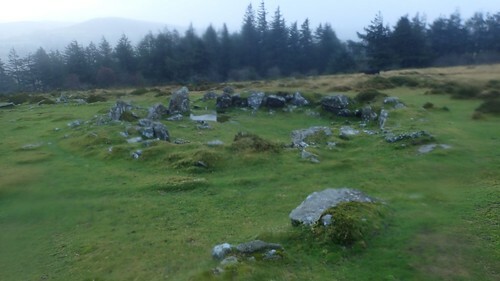 These may be the hut circles that are marked on the map beside Kestor’s summit. Following my photos in the order that they were taken then, this might well be Kestor at 437 metres above mean sea level. With no means to escape the wind and rain, we marched pushed on. Another tor and I’m lost as to where we were on the map, by this point! 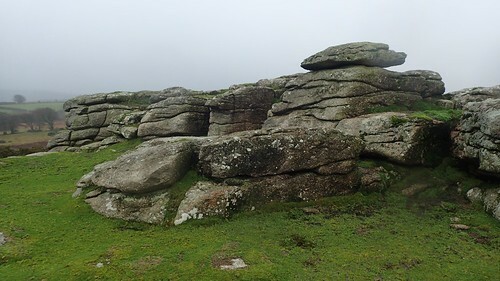 It’s possible we hadn’t actually reached Kestor yet and that the first tor was Frenchbeer Rock… Meaning the one above could be Middle Tor. 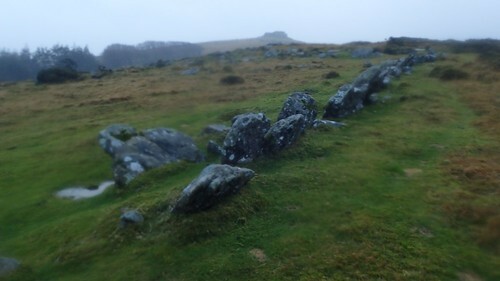 Whichever tor this was – Kestor or not – the wind and gusts felt from the top were extreme! Just a few metres lower and it wasn’t nearly as bad. 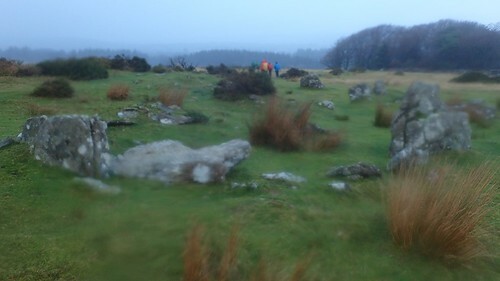 From wherever we had been, we soon began our descent from the moor, passing this stone circle along the way… You might think this would help me in my effort to identify a location but, no, I’m still at a loss! 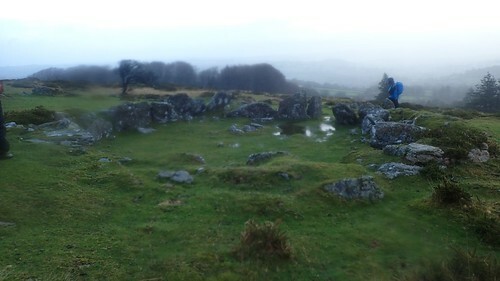 There was also evidence of a larger stone row or stone circle surrounding this. But still, I’m struggling to pinpoint any of this on the map! 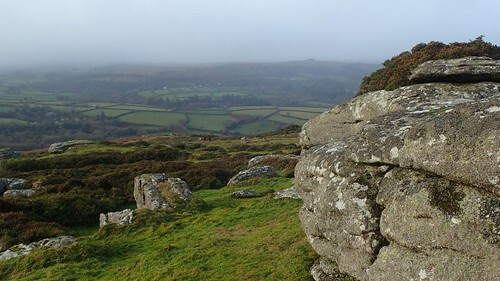 Somewhere in all of this and before reaching Kestor, we’d stop for lunch beside a bank of earth next to one of those random roads that runs over Dartmoor. 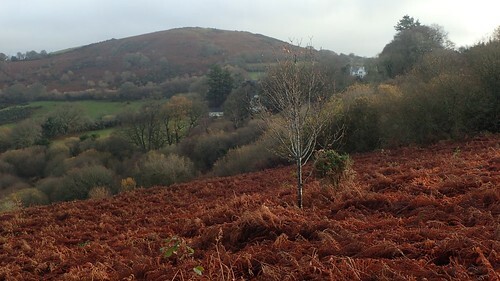 Our walk back to Chagford would mostly follow roads and we probably left the greater moor near Teigncombe, in contradiction to what I wrote earlier! 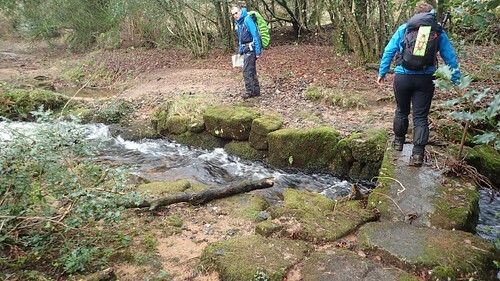 The North Teign River was our guide as we occasionally stopped to allow traffic to pass. 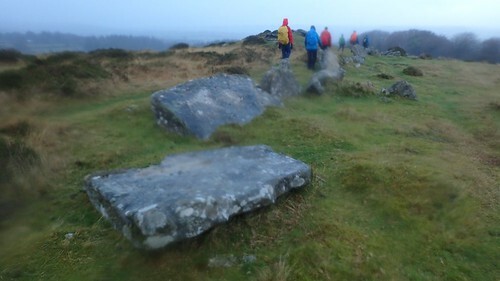 A hard (if not dry) surface beneath our feet was quite welcome. 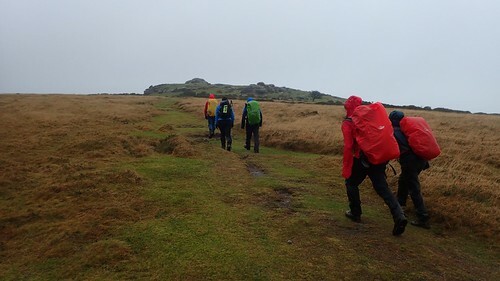 This day had been the most mild of the weekend but it was ridiculously wet, almost as if Dartmoor (know for having it’s own weather system) was taking one last laugh at us, as if commanded to ‘FINISH HIM!’. There had been talk about closing the walk at a tea shop, of which there is at least one in Chagford that’s open on Sundays. We made use of the free public toilets in the village centre but, with everyone soaked through and rummaging for a dry change of clothes, we decided to head home. I think it was four-years ago that Brunel last held its annual “Christmas” weekend away in Okehampton. 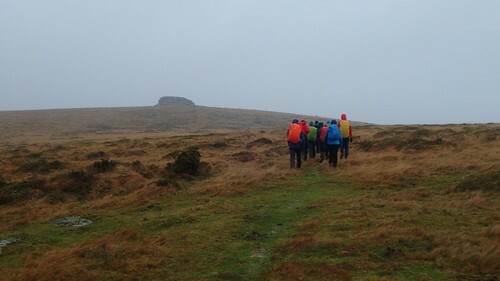 Even then, I’d inwardly asked the question: ‘Why would anyone want to go to Dartmoor in November? !’ We’d endured so much wind and rain but that didn’t alter my overall positive experience of the long weekend. I’d happily head here again, when the time comes. 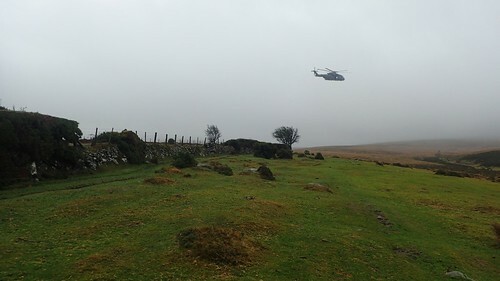 Dartmoor is bleak but undeniably beautiful in its own way and I know that, personally, I have barely scratched the northern tip of its surface. 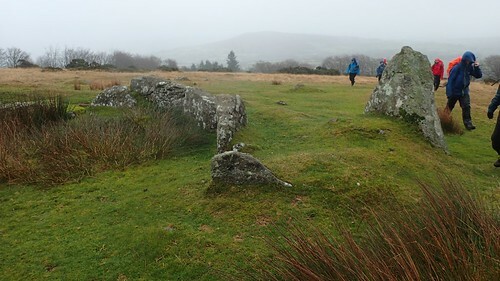 This entry was posted in Dartmoor and tagged bleak, British weather, Brunel Walking Group, Chagford, Chagford Common, Dartmoor, December 2018, hiking, Jurston, Kestor, Meldon Hill, Ramblers, Teigncombe, Two Moors Way, Walking on 16/12/2018 by Olly Parry-Jones.